When an artist reaches a fork in life’s path, it can be difficult – and personally defining – to choose the right direction. Dixie Orriss took the longer path, and the resulting maturity of artwork is proof that she chose correctly. Grant McConnell, an artist and educator, advised Orriss early in her career that with the “facility of ease of painting, early success can sometimes get in the way of a growing ‘talent’,” and this has certainly proven true in Orriss’ artistic development. Orriss remembers being in awe of one of her three older sisters at a young age. Seven years her senior, Orriss’s sister was taking an art course through correspondence at the local high school. “I thought she was so talented,” remembers Orriss, “and I knew that I wanted to grow up and be an artist.” The only problem was how to get there. Born in 1961, Dixie Orriss was raised on a farm twenty miles from the small Alberta town of Coronation. Having older siblings, she was often left to her own devices, and learned to make her own entertainment. Being a tomboy, she took part in helping her father with the livestock, and had numerous pets, including her first pony at age five. Although Orriss showed interest in art in school, these experiences were inconsistent and often discouraging. In Grade 5, her art teacher was especially thrilled with one of her watercolours of a deer in a forest. She gave Orriss the choice of entering the work in the local fair or into an art competition at the Calgary Stampede. Although the deadline for the Calgary art competition was drawing near, the teacher decided to send Orriss to the post office with a package of her art bound for the Stampede. When Orriss and her family went to Calgary to view her submission, it hadn’t arrived! “I don’t know what was more disappointing, the fact that the watercolour never made it, or that I wouldn’t get it back,” she recalls. Coronation’s Junior High art teacher also taught science and career counseling. When Orriss completed a questionnaire to determine her best career, the result was a Commercial Artist. Knowing that the instructor was also her art teacher, she asked the teacher for his opinion. Presumably trying to be realistic, his response was that it would be too hard for her to make a living as an artist. Disheartened, the young Orriss nursed an abiding interest in art, while her second love, horses, became her primary focus. She belonged to the local Horse 4-H club, joined the Pony Club, and was showing her horses at the local fairs with such success that at age 16, she was the Coronation Rodeo Queen. All the while, she would create drawings of horses and give them away to friends. She attempted to teach herself how to paint with oils, but found it difficult with little knowledge or background on the subject. 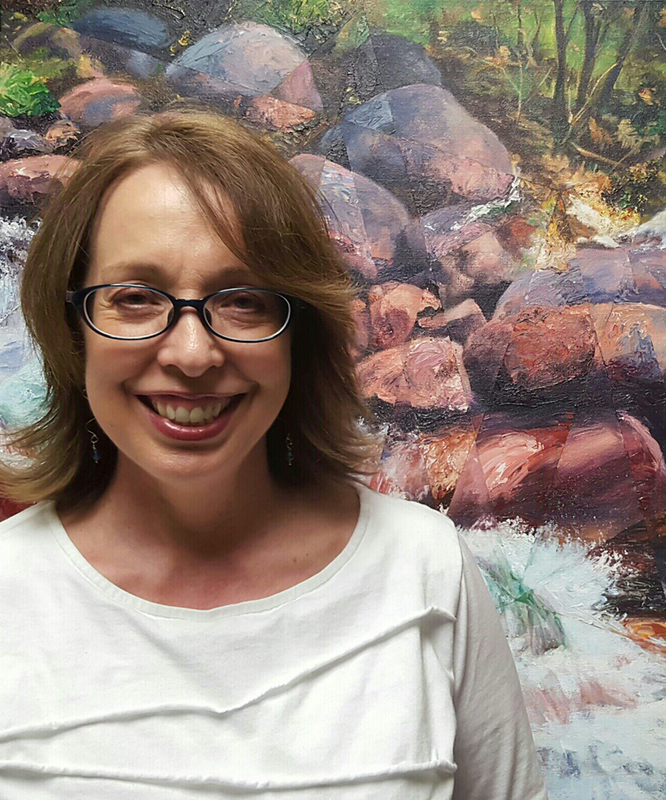 After graduating from high school, Orriss decided to put art behind her and apply to the Faculty of Science at the University of Alberta. Her application was accepted, and at the same time, Spruce Meadows, a top show jumping stable in Calgary, offered her a job as a groom. Orriss groomed for two of Spruce Meadows’ top competitors, and had a chance to travel all over Canada and parts of the USA, even spending three months in California. “The best part was getting to ride these beautifully trained horses,” she explains, “and to travel over different parts of the country. It was a lot like when I was a child when we would go on road trips with my family for summer vacations. Only this time I got to stay in hotels instead of a tent.” Implacably creative, she sketched and took pictures of the local scenery all throughout her travels. The paintings in Dixie’s Divided Essence series each have caused me to be taken aback. At first the scene seems fairly straight forward, but on closer examination, the fragmented parts separate and let you enjoy the experience of seeing the entire spectrum of textures and applications working together. These contrasting displays side by side all working in unison. They encourage your eye to roam from shape to shape, the whole time stimulating your imagination. but chose the latter as she thought there was more potential for job opportunities. While attending school, Orriss met a fellow student registered in the Arts Program. After obtaining a diploma in Biological Sciences Technology in 1986, Orriss found employment at the University of Alberta in one of the first diabetic research facilities to transplant islet cells into diabetic patients with positive results. A year after starting work, Orriss decided to take a Drawing I course at the Alberta Art Gallery. She enjoyed it immensely and enrolled in the Drawing II course, which was cancelled due to lack of interest. Searching for more training, she found artist Jean Birnie, who was operating a private art school. Orriss’s persistent desire to adapt art into her life was about to pay off. After researching several locations, Orriss chose to open her school in St. Albert, a community on the outskirts of Edmonton, Alberta. She named her school Pygmalion School of Fine Art, adding the motto, “Bringing Art To Life.” It wasn’t long before her clientele grew, and she was able to start painting in a series and showing at the local art organizations. She was introduced to her husband, a picture framer from an artistic family background, at one of these exhibitions. It was a juggling act for Orriss, but she was able to balance her family and her business with her art. and soon two paintings that were being exhibited in Quebec were selected for a traveling tour to be displayed at the Miniature Museum in France and a Contemporary Art Museum in Italy. Soon after, Orriss exhibited a landscape series in several solo exhibitions locally and in surrounding community galleries. It was during her latest series that her current style of painting started to evolve. She began masking geometric shapes over beautiful landscapes to alternate different effects in clearly defined sections. As her series progressed, sections alternated in lights and darks, tonal colors, and finally texture, as the most recent paintings fluctuate between thicker paint applied with a painting knife and paint applied more smoothly with a brush. Orriss’ paintings perform this magic of “bringing art to life,” as they represent landscapes full of motion that actively speak to observers, bringing them closer to a bounteously textured and noisy scene, while evoking a more quiet, serene grandeur of nature. 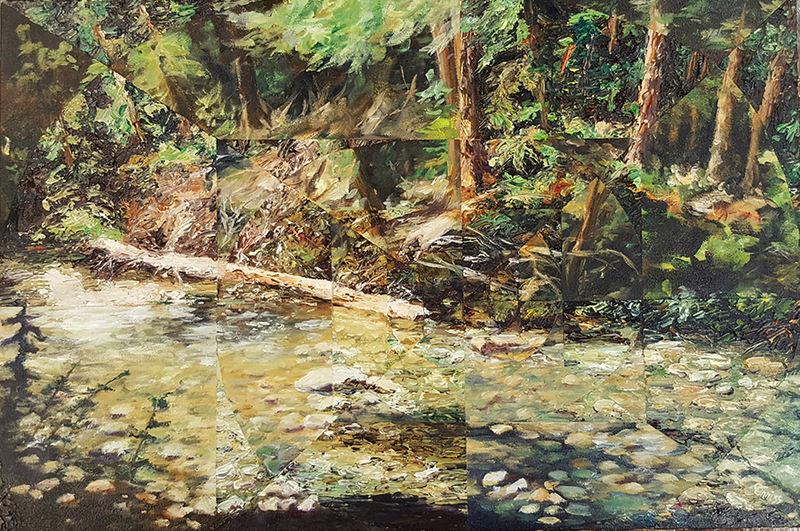 In the resulting paintings, a fractured landscape simultaneously recedes and comes forward while you approach the image. At first, the mind perceives each painting as a complete landscape; then, as you move closer and examine the details, it breaks apart in a pattern that pulses back and forth. 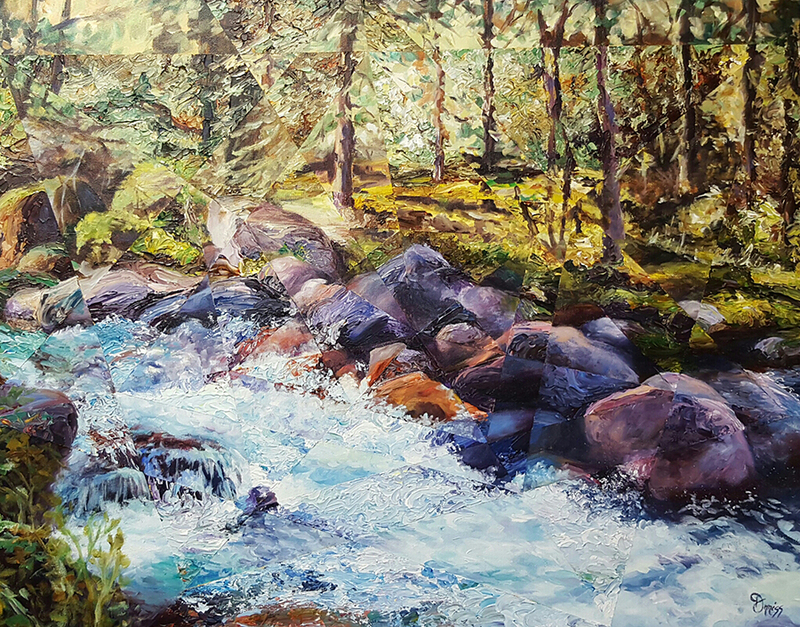 Orriss’ paintings perform this magic of “bringing art to life,” as they represent landscapes full of motion that actively speak to observers, bringing them closer to a bounteously textured and noisy scene, while evoking a more quiet, serene grandeur of nature. 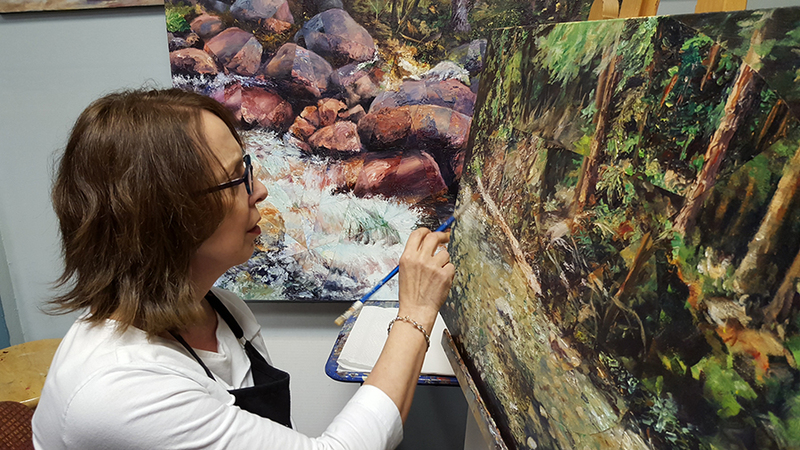 Orriss’s artistic career has developed through a gentle persistence that allowed life to meander where it might, while ultimately embracing the study and practice of art wherever opportunity arose. Her successful integration of art into everyday life, as a satisfying hobby or career aspiration for her students, and as a productive and passionate artist herself, is an inspiring example for would-be artists at all levels and walks of life.